I was a junk food prince as a kid, wrappers strewn across my room. I ate aimlessly and without purpose. I ate to make my teeth sore and to turn my tongue the unnatural shade of "blue raspberry". I ate because my father ate the same way. I ate because it was the only food in the house. My sister's birthday is the day after Halloween; we'd always go to the dollar store to buy the discounted candy on our way to her birthday party. For Christmas, I would remind my parents every year that I wasn't partial to chocolate, but loved fruit snacks and gummies. When Nolan and I lived in California, I would make a stop to the 7-Eleven for Mike and Ikes when I was stressed from school or work. And when I was in kindergarten, I got an ulcer from stress, too, and my father brought me a candy bar when I wouldn't stop crying because I wasn't a very good reader at the time. I'm a snacker, a grazer. I munch absentmindedly to pass the time between loads of laundry and replies to my emails. But I'm 25 now and my metabolism is changing and I change with it. I was nervous to reinvent anything from my childhood, but I was excited to use these blood oranges I bought on a whim. And so I made fruit leather, but they'll always be fruit roll-ups to me. A true blast from the past, these are my favorite kind of recipes. I love sharing with you what it was like growing up in Kentucky and Pennsylvania and the kind of food I ate there. These are so easily adaptable to any fruit, just replace the whole fruit with another of your choice and adjust the liquids and sugars accordingly. Keep in mind that the oven temperature is long and broad and to check periodically, especially the edges, which may burn a bit. Ina Garten's Halloween Bark: My First Non-Recipe! When I was younger, Halloween was always my favorite time of year. Other than for the obvious reason (my sweet tooth), Halloween was the entree into the holiday season. The leaves that fell were raked into piles, my sister and I would roll in them as children. We got older, she got a boyfriend, and still I loved Fall. To dress up, to be someone else, a form of drag and an exercise in imagination. I wasn't invited to a lot of parties, so I dressed up as a cowboy, a princess, and one year when we were very poor and very lazy, a dining room table. The cheap dollar store masks that stuck against your face, breathing the stale, moist, reused breath all night. My mother and I would eat candy, watch a movie, go to sleep with a wrapper clutched in my hands. Our town was not set up for trick-or-treating back then, so we'd buy our candy in bulk and snack on it into Christmas. Santa-shaped sugar cookies found themselves next to orange and black wrappers on the buffet. We don't do this anymore, traditions change and I changed, too. But now we have Lana, my niece, and we think back to all the old things we did as children and how we can improve on those things now. I updated a simple recipe, chocolate bark, to get rid of all of that chocolate sitting around before the holidays roll in. And it just so happens that Rebecca over at Displaced Housewife had a very similar idea too! This is essentially a "non-recipe" due to the fact that it doesn't take any skill, is totally adaptable, and requires no prep of any sort. Further, this is labeled as Ina Garten's because that's who I went as for Halloween this year!! A picture (and video!) follow the recipe below! Add remaining chips that were reserved (this is a very easy way to "temper" your chocolate, actually learned by Ina! And here, for documentation purposes, is my Ina Garten Halloween costume!! I was an alchemist this week, I created gold from sugar and cream. I left the pot boiling and filled the dogs' water bowl while it simmered in sticky excess of itself. A wooden spoon sat sideways off a plate, dripping liquid sugar, hardening in stalactites of golden-browns. Candy making is a simple pleasure. It brings joy; so I make it. I whisk things into an emulsive state, I tuck them away in boxes and blankets of tissue paper. I do it for the pleasure of family practice, to keep the heartbeat strong between my mother's craft and my hobbies. I do it to feel her pulse on every countertop surface. She showed me at Christmas how to temper chocolate and three months later I began a candy business. She showed me at Christmas how to make caramel and I haven't stopped trying to perfect the recipe. I make candy to remember my past. To remember my mother, to remember my high school friends who passed around bags of Werther's Originals in AP Chemistry. The nostalgia I feel is simple, heartbreakingly simple. I make candy so I don't forget those feelings, those memories. I can create magic through baking, I'm able to revive the dead. Necromancy vis-à-vis the Maillard Reaction. I created these caramels with this intention. To layer all my old selves into one complicated morsel, to embrace those resurrected memories and wrap them in wax paper, tuck them away in a small and pretty box, and pull them out when I start forgetting where I came from. Savory and sweet caramels topped with a curious salt. Makes 81 pieces. Heat on medium-high and allow to simmer until butter is melted. Stir occasionally to incorporate ingredients. Once butter is melted, bring to a boil on high heat. Boil for 5-7 minutes. Lower heat to medium and simmer for 27-35 minutes. Bubbles will appear tight and sticky. Do not stir once reached this stage, but allow mixture to continue to caramelize. It will become slightly fragrant, smelling fatty and slightly nutty. Using a ruler, mark and cut into inch pieces. Cut using a sharp knife or bench knife. Wrap in wax or parchment paper. Two different people. I used to be this kid who wore black, that wore my grades as a mark of honor, who would smoke a cigarette and hold in my cough until no one was looking. I used to live in a world of dichotomies, I took one direction, judging those who took the other. Bitter and self-centered, I hated everything that wasn't within arm's reach, anything I had to work for. I was this lazy with all the best relationships I've ever held onto--from Nolan to my mother. I was like this in law school, in California. I left this person there, too. In the last two months of living in Texas, living alone for the first time, I've grown into a new person. Soft and muted blues, greens, greys--I don't hide behind a layer of black, a 4.0, or in a puff of smoke, indiscernible from the fog that hung over Pittsburgh most mornings. I appreciate beauty and tones, floral and minimalism. I respect the curated life, the plant you buy for decoration and how it differs from the one you buy for herbs. I work with my hands now. I feel a vernal change in my bones to produce, to craft, to create. I have callouses that have softened over from when I would hold a pencil too long, back in the day when I held a pencil to write at all. My working hands are toiling again. I'm creating candy bars, confectionaries, memories. Someone's breakfast, someone's "cheat day". I appreciate a good cup of coffee above most things, and that's something that hasn't changed between the old and the new life I have. 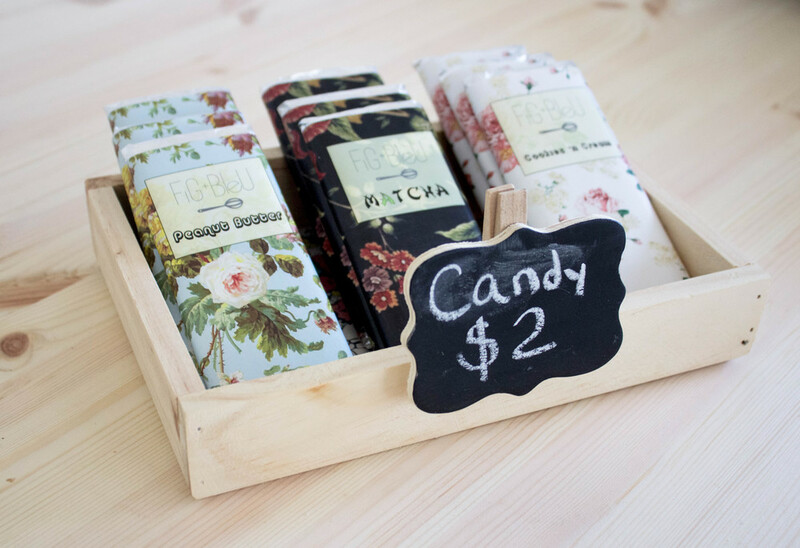 That is why I went to Press Coffee with a simple idea: I want to sell candy. A simple stand, a couple dollars a bar, for an hour or two to get my name out there and have some fun doing it. Press was, to me, the perfect venue. From its wonderfully curated decor to its light-dappled cafe tables, Press understands appreciating the small, everyday victories of the perfect cup of coffee, the first bite of a crisp pastry, finding the just-right leather chair to sit in and enjoy the morning for what it is: an opportunity to create, relax, not take life too hard or seriously. I would have never thought of the generosity that would come of Natalie offering to give me liberty on stocking them as often as I could produce them. I am dropping off my second order this morning. Twenty-seven bars of Matcha, Cookies and Cream, and Peanut Butter. They're delicate and snap when you break them. They're wrapped in the same designs I used for Nolan's Valentine's Day present, florals for spring*. They're one of the simple pleasures we allow ourselves to spend money on, and maybe one of my customers will share his with someone he loves today. I hope, whoever buys one, they'll recognize the attention each bar got from me. From cutting the wrappers to measuring the foil, to getting the perfect process of tempering and cooling, each bar was made from my hands, hands that once held pencils too tightly, cigarettes too loosely, and another boy's hand too recklessly. If you're located in the San Antonio-area, stop by Press Coffee at 606 W French Place 78212, and maybe I'll see you there, too! (Usually for only, like, five minutes in the morning before work, though). And finally, a special thanks to Samuel Nuñez for creating such an amazing logo, that inspired so much of my work this last month--from the candy bars to actually making this website a thing. Go check him out, too!